Hope everyone had an awesome weekend, wishing it would have been longer so I could have gotten more things done. I'm trying to get these Maven swatches and reviews as soon as I receive them but that proves to be a little difficult sometimes. Especially when my to-do list is a mile long, haha. This month's theme was The Riviera and it was mostly a creme box! Both a good thing and a bad thing if you're like me and are a bit iffy on their cream formula. All the colors are extremely gorgeous and perfect for spring time. The first one in this collection is the cute Margaret, a light periwinkle creme polish. I have to say I think the name for this one is just so appropriate. The name Margaret just makes me think of the color periwinkle for some odd reason. I can see this one not being everyone's favorite shade but I think it looks really different and that's what makes me like it. Swatched over a clear base, used two thin coats, and sealed with a fast drying topcoat. 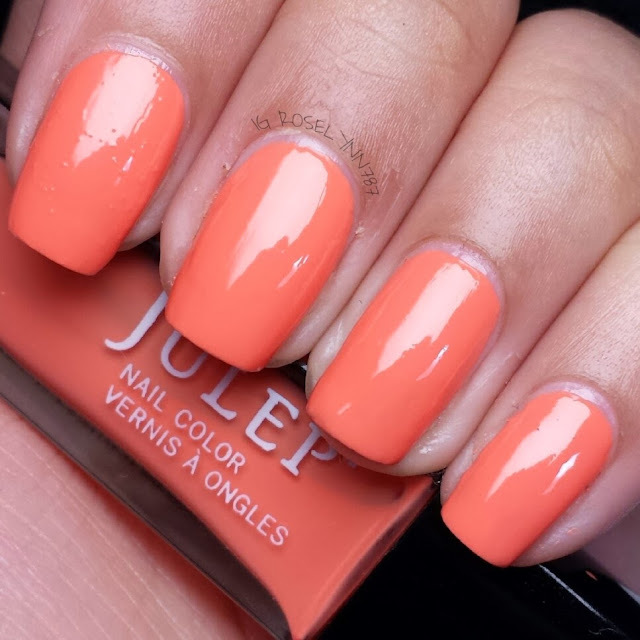 As I've said many times before, I don't like the application for creme polishes from Julep. It was streaky in one coat but the second one fixed that right away. The application was also extremely thick for me so I had to add a bit of thinner. The next one is Lizanne, a sea-green shimmer polish. Color wise, I think this shade of green is my favorite from this month's box. I have been looking for one like this and was having such a tough time trying to find one. I apologize for the horrific job at swatching this particular polish, some days the polish and the nails are at war. This was one of those days. Swatched over a clear base, two thin coats used, and sealed with a fast-drying topcoat. As the previous polish this month, this one is a bit streaky as well in one coat. You'll need another layer to fuller opacity. Now for the major deal breaker... it's a stainer. I'm not talking a little staining. Big time staining (even while using a base coat), so that was a major disappointment. And the last one this month's Maven box is Princess Grace, peachy creme polish. The color is much more of a Papaya shade rather than a peach in person. I love how much this shade stands out. I'm sure that despite the problems I have with cremes by Julep I will be using this one over and over again. Swatched over a base coat, used two thin layers, and sealed with a fast-drying topcoat. Out of all the ones this month, this beauty has the best application. Not too streaky but it is a little thick. 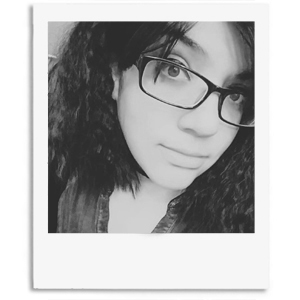 I added thinner and that helped a good amount. So if you can deal with that then this one is definitely my must-get for the month. Overall while I think the shades this month were great picks, I was very disappointed with the application of each one. Perhaps it's the brush? Maybe. I'm not sure but Julep you're killing me with your beautiful colors and lackluster formula! I still have hope that by the end of this year I'll receive a box and not have a complaint about the application. Until later polish-gators (that made no sense, I need a better catch-line lol). Thank you sweetie for stopping by, I'm so happy you like my blog. I don't have many tips but as someone that started not too long ago I can share some of the things I learned. Post regularly, have high-quality photos, make your content interesting, and find your voice. It has taken me months but I think I;m starting to nail those things (no pun intended). Also put the widgets on your sidebar to make you easy to follow back ;) Hope this helps. Visiting from the Mani Monday linkup and I loved seeing these swatches! You've got some seriously beautiful nails. 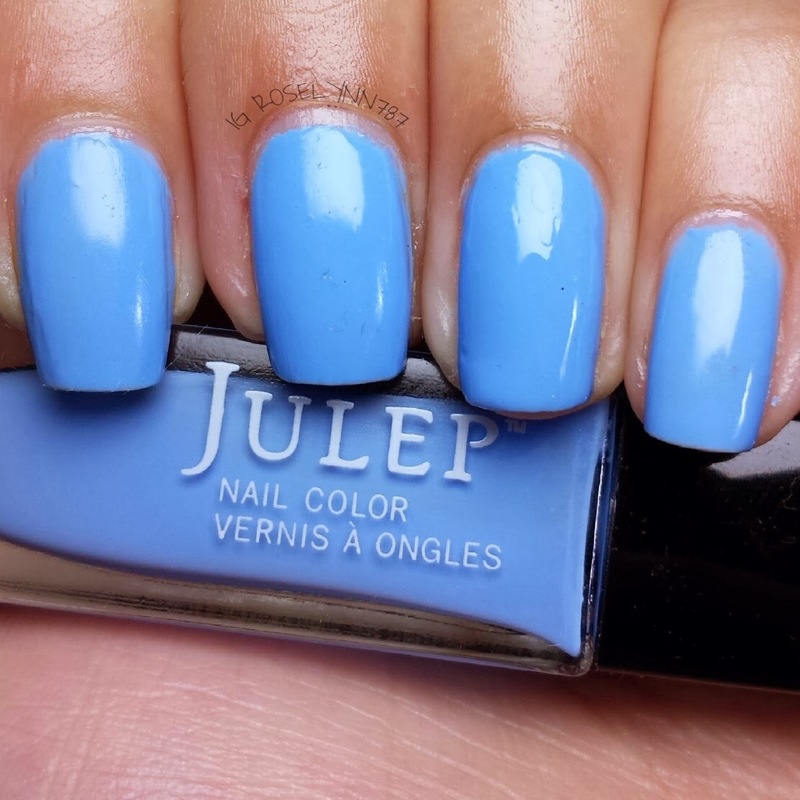 I got the last two shades from Julep as add-ons, and I'm glad to know I should worry about staining from Lizanne - I'm still trying to let my nails recover from the stain Julep's Abbie gave me! Thank you :D With so many breaks lately I thought I'd hate my new nail length but I actually love it now and think I'm going to keep them like this. Staining is the worst and Lizanne is pretty strong but yet still such a cute color. I used Bubble White to soak and ease the staining afterwards and it helped. Though as a swatch I had Lizanne maybe on for half a day before I removed it. Not sure if staining would be worse or better after a few days. 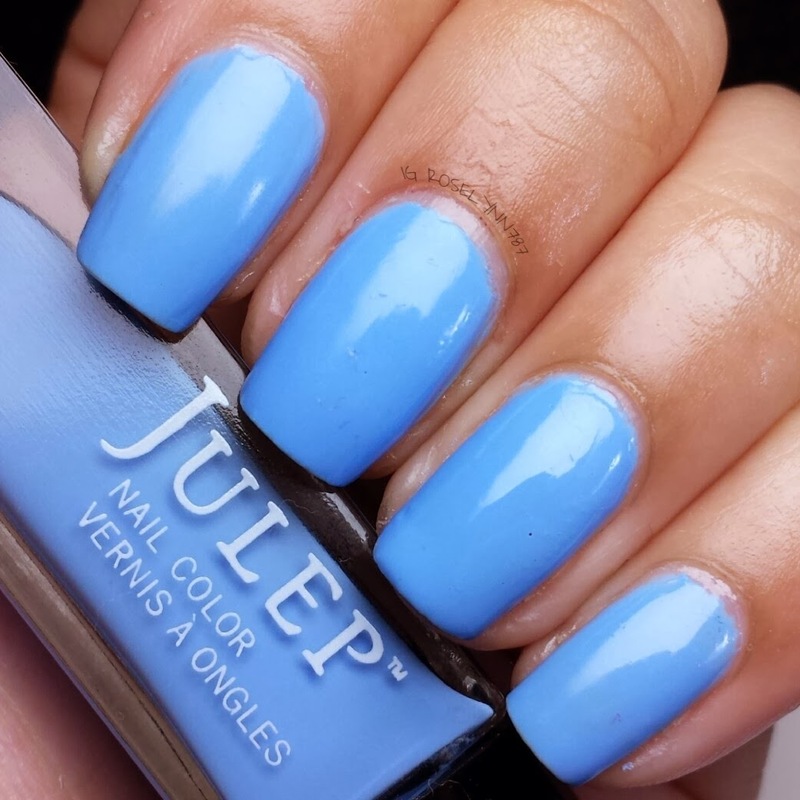 I am in love with Julep. However, I skipped the March box. But I love the colors you got. They look very pretty. Sometimes, its so hard to tell even with the swatches on their site, just cause they have all these fancy ways to make it look perfect so it's nice t see when others swatch them in normal settings. But I think you got a great box. I'm really excited to see what April's boxes are going to be!